In the civics-book perspective on the American political system, presidential elections help make government work. They allow nominees to set a national agenda for the two major parties that transcend the regional differences and messy constituency-tending that so often occurs in Congress. And they pull the parties towards the political center, where swing voters live and bipartisanship thrives. This is made even more likely by occasions where you happen to have two candidates—say, an incumbent president and a challenger who is either a consensus nominee or a party leader in Congress—with a stake in successful governance and an eye trained on the general election. But the 2012 Republican presidential nomination contest is showing the flip-side of that proposition: In a highly competitive primary field where most of the candidates are not in federal office, and all are campaigning avidly against “Washington,” they are not exerting pressure on the party and its representatives in Congress to move towards “the center,” and, in many cases, they are pushing in the opposite direction. The preeminent example of this dangerous feedback loop between the GOP presidential candidates and Republicans in Washington is the ongoing stalemate over the budget and the debt limit. The maximalist conservative position on the issue, called the “cut, cap and balance” pledge, was originally staked out by the House Study Committee and South Carolina Senator Jim DeMint. Designed to create an air-tight formula against any compromise with Democrats on the debt limit, the pledge includes two different methods for permanently limiting federal spending to a drastically lower percentage of GDP than currently prevails, a California-style constitutional provision requiring a super-majority for any tax increases, and a demand for immediate spending cuts beyond anything ever seriously discussed in Congress. Despite the fact that the pledge originated with extremists in Congress, nearly all the presidential candidates rushed to attach their names to it. 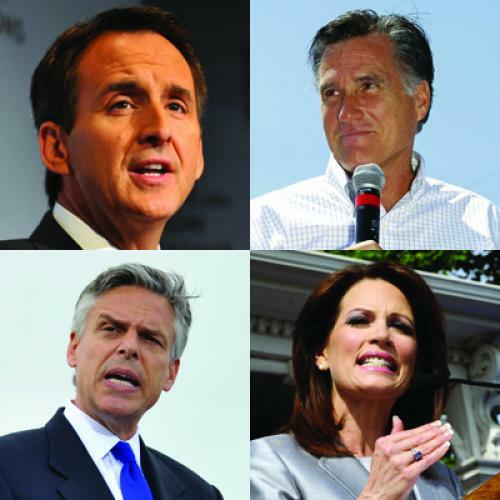 As it stands, no fewer than six of them, including supposed “moderate” Mitt Romney, have signed on. Other than Jon Huntsman, the only holdout is Michele Bachmann, who is trying to stake out a position to the right of “cut, cap and balance” by making repeal of ObamaCare a precondition for any debt limit increase or budget deal. What began as a fringe pledge, in other words, was soon elevated to Republican orthodoxy by the embrace it received from GOP presidential candidates competing to claim the “true conservative” mantle. In this way, Republican ultras in Congress are successfully using the presidential field to increase pressure on their own leadership to abandon negotiations with the White House and congressional Democrats. And with the Iowa Caucuses dominated by hard-core conservatives, and Senator DeMint standing astride next year’s all-important South Carolina presidential primary, it’s no surprise the strategy is working. This upward ratcheting of pressure is also illustrated by yet another “pledge” recently demanded of presidential candidates by the upstart anti-abortion group, the Susan B. Anthony List. Breathtaking in its scope, the SBA pledge involves a commitment to appoint only certified “pro-life” figures to specific federal cabinet and sub-cabinet posts, support for sweeping bans on federal funding for any entity or contractor involved in entirely legal abortion services, and an agreement to promote and sign a federal version of the “fetal pain” bills, which ban abortions after 20 weeks of pregnancy in defiance of past Supreme Court decisions, that are currently being enacted in several states. Confronted by the pledge, all but two presidential candidates—Mitt Romney and Herman Cain—promptly signed it, and the holdouts hastened to express their firm support for the complete abolition of abortion rights. The Republican line on abortion had once again shifted even further right, if possible, from where it had been before. Finally, the GOP candidates’ reluctant embrace of Paul Ryan’s radical proposals to end Medicare as we know it has ensured that the contours of Ryan’s unpopular plan will continue to hold sway over the Republican Party going into 2012. Initially, the candidates cast a wary eye towards Ryan’s plan, even as nearly all House Republicans (and later Senate Republicans) voted for it. While praising the Wisconsin representative and making vague noises about their own determination to control entitlement spending, the candidates preserved their right to issue their own proposals in good time. But then Newt Gingrich spoiled the game by openly criticizing Ryan’s treatment of Medicare as “right-wing social engineering” that hadn’t a chance at public support, and in the ensuing furor the stampede began. One by one, Republican candidates, including a chastened Gingrich, lined up in support of Ryan’s entire budget, thereby making a virtual abolition of Medicare a party-wide stance that Republicans now cannot possibly hope to live down. (Indeed, the desire to obtain bipartisan cover for radical changes to Medicare is probably the only factor other than Wall Street pressure that is keeping alive congressional Republican interest in a budget deal with Obama). It’s an open question whether Republican candidates are concerned about, or even aware of, the risks they are running by colluding in their party’s ideological bender, both in terms of their chances in the general election and in seeking to serve as president if elected. Mitt Romney, who is in the anomalous position of being transformed from the true conservative champion of 2008 to today’s moderate establishment candidate, even as he has become tangibly more conservative on the issues, probably understands it. But most conservatives appear convinced that 2012 will be a referendum on Barack Obama and the general direction of the country—one that Republicans can’t lose as long as their base turns out. And in the meantime, the complicity of the GOP presidential candidates in right-wing efforts to “stiffen the spine” of Republican officeholders against the temptations of bipartisan governance is contributing to genuine risks for the country.